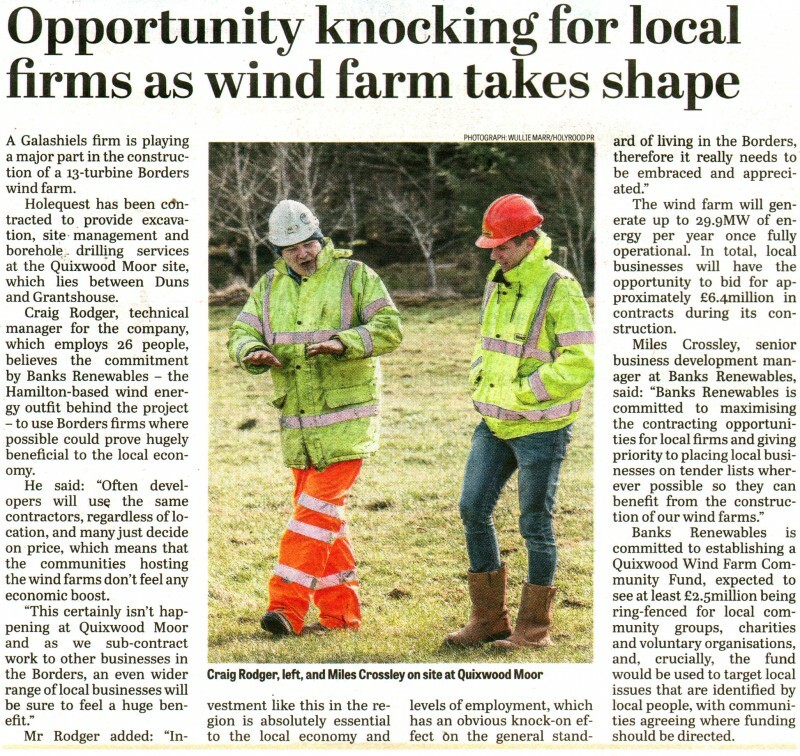 Pre construction work is now underway at Quixwood Moor Wind Farm, with Banks Renewables committing to using local companies wherever possible in the development of the wind farm – providing a huge boost to local Borders businesses, the first of which being Holequest – a Geotechnical services firm based in nearby Galashiels. The news has hit the press hard with coverage from local newspapers; The Berwickshire News and The Southern Reporter which also utilised great PR pictures from the work site to maximise the coverage gained. Local paper coverage is vital to the work our Scottish PR Agency carries out for Banks Renewables, find out exactly why by clicking on this link. Thanks to the work of award winning Scottish PR agency Holyrood PR the story also made for hugely positive reading on respected renewables industry websites Renews and Electric Energy Online. The 13 turbine wind farm between Grantshouse and Duns will generate up to 29.9MW of energy per year once fully operational. In total, local businesses will have the opportunity to bid for approximately £6.4million in contracts during its construction. Clearly this is big business for the Borders and Scotland in general – hence the clamour for the story across the business networks, with articles featuring across a range of the Scottish Business News Network websites and on Business Quarterly’s website and widely read and respected newsletter. This latest media triumph for our client Banks Renewables reflects the ongoing work from the award-winning team at Holyrood Partnership.